Cloud computing is rapidly becoming the most critical data solution in our increasingly mobile and digital lives. For businesses, cloud computing can bring down expenditures on hardware and IT and make expansion and upgrades seamless. For individuals, the cloud makes your data as mobile as you are and eliminates the nightmare of experiencing a hard drive crash without an up-to-date backup. Cloud computing is also integral to the growing Internet of Things (IoT), which brings everything from cars and home appliances to medical and farm equipment into the connected world. As Money Morning Defense and Tech Specialist Michael Robinson writes, "We're talking about a world in which just about every physical object… is in some way connected to the web." Given cloud computing's role in this growing phenomenon, it's no wonder that research firm Gartner projects the cloud computing market to grow nearly 60% to $278.3 billion in the next three years. If you haven't already gotten in on this trend, we've got a quick and easy way for you gain broad exposure to the cloud computing industry. In one simple step, you'll start reaping huge profits from this sector. Then, for those looking for even more exposure, we'll give you a bonus play that could hand you an extra 50% on top of it. But let's start by taking a look at the best ETF for this industry: First Trust Cloud Computing ETF (NYSE: SKYY). SKYY has doubled in value since Michael Robinson recommended it to Money Morning readers in December 2013. And over the last two years it has beaten the S&P 500 by 172%. Still, this collection of 28 of the most important players in the cloud computing industry is available for just a little more than $50 per share – and it's got a lot of room to grow. The ETF is structured into three broad categories. The biggest chunk of the portfolio is devoted to 17 pure-play cloud computing companies, each accounting for roughly 4.5% of the total portfolio. These are either direct cloud service providers or companies that provide various cloud-based products and services. That includes a few more big names, like Alphabet Inc. (NASDAQ: GOOGL), Amazon.com Inc. (NASDAQ: AMZN), Facebook Inc. (NASDAQ: FB), and Netflix Inc. (NASDAQ: NFLX). VMware Inc. (NYSE: VMW) is a top provider of cloud computing and networking solutions to a wide range of industries. Its healthcare software, for example, allows practitioners to stay mobile and access patient information and other relevant analytics on their smartphones – without compromising the security of that data. Cisco Systems Inc. (NASDAQ: CSCO) is a Silicon Valley tech giant that's been around for over three decades. Its founders were pioneers in connecting PCs via local area networks (LANs). More recently, it's developed a hybrid cloud solution for Google Cloud customers, creating stiff competition for Amazon Web Services. Open Text Corp. (NASDAQ: OTEX) confirms Michael Robinson's mantra that every company is a tech company. It provides cloud-based information analytics for just about every facet of institutions large and small, enabling them to increase efficiency, cut costs, and generate bigger profits. 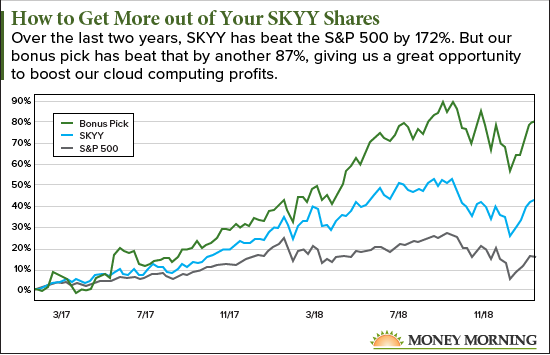 The final category of SKYY's holdings is non-pure-play cloud computing companies. 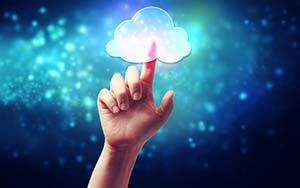 These seven companies provide products and services that support cloud technology indirectly. This category also includes some of our past favorites, such as Adobe Inc. (NASDAQ: ADBE) and Activision Blizzard Inc. (NASDAQ: ATVI). And each of these companies come in at only around 1.4% of the total portfolio. SKYY certainly gives us a solid mix of cloud computing companies. But sometimes a company with much higher than average profit potential gets only a small allocation in an ETF's portfolio. Buy a few extra shares of that "rocket stock," as Money Morning Chief Investment Strategist Keith Fitz-Gerald would call it, and you can instantly turn your foundational ETF into a supercharged pair of investments. And SKYY provides us one stock in particular that's exactly what we're looking for. As we mentioned, SKYY has beat the S&P 500 by 172% over the last two years. But our target stock has beat even that by a wide margin. If you invested in SKYY during that time, you're pretty happy with your 43.8% return. But if you had added one share of our stock pick for each share of SKYY, you'd boost your gains to 66.5%. That's an extra $52 in your account for every $100 you invest. We're not talking about a high-risk speculative pick here either. This is a company that doesn't just have the cloud computing trend pushing it up. It also combines one of the most stable industries on the planet with the fastest-growing sector of the U.S. workforce.